An attractive 17th or 18th-century dovecot containing hundreds of nesting boxes, built to a rectangular plan with stepped gable ends. 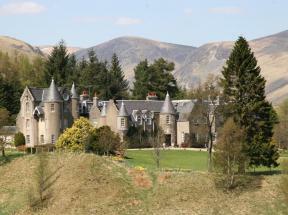 The dovecot was part of the Westquarter House estate (now destroyed). 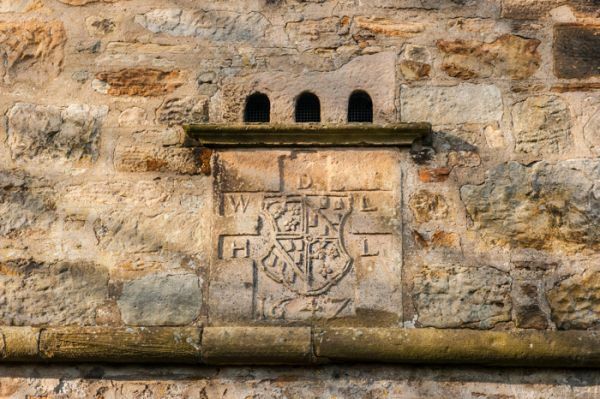 An heraldic panel over the doorway is dated 1647 and bears the arms of William Livingstone of Westquarter. 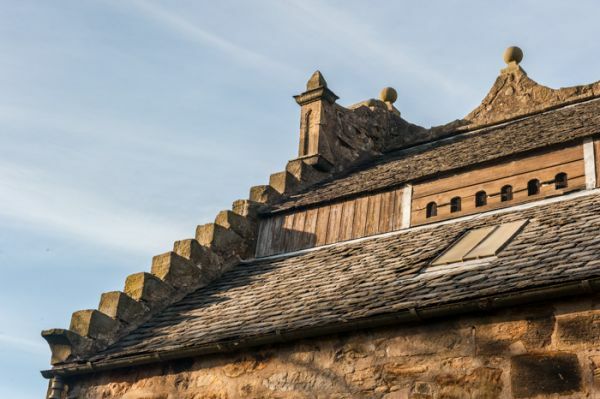 Despite the presence of the shield, the architectural style of the building suggests an 18th-century date, with the shield a later addition, brought here from another building, possibly an earlier dovecot on the same spot. 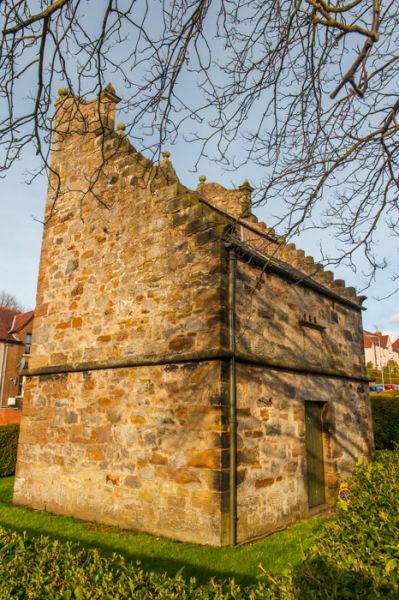 The dovecot is built of rubble and measures 18'3" by 16'3", with walls almost 3 feet thick. 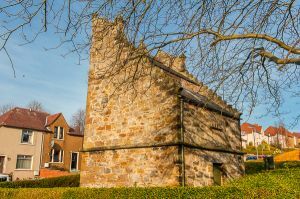 If you think of dovecots being simple structures of no particular architectural interest, you're in for a rude awakening at Westquarter, for here the dovecot is a striking building like a miniature manor. One hopes the doves appreciated their distinctive home! The approach to the dovecot doesn't seem to be signposted at all. We looked, but never did see a typical brown tourist sign. There is a small tourist information panel just inside the hedge that surrounds the dovecot, but that seems to be the extent of Historic Scotland's information efforts. What makes visiting a rather odd experience is that the dovecot stands at the end of a suburban street, with a modern housing development on all sides. It's like a little island of history in the midst of an ocean of modernity. 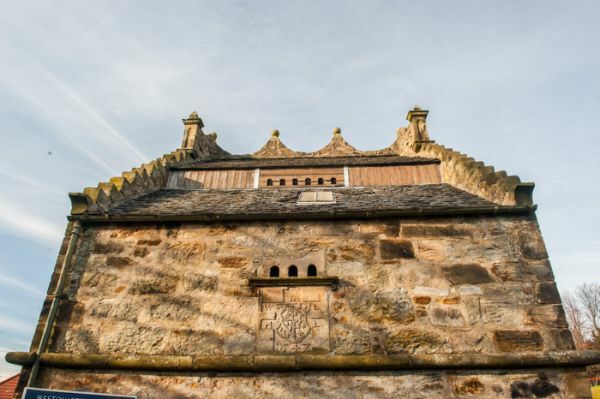 There is no dedicated parking area, but you should be able to park somewhere along the street, which runs by only a few steps from the dovecot. 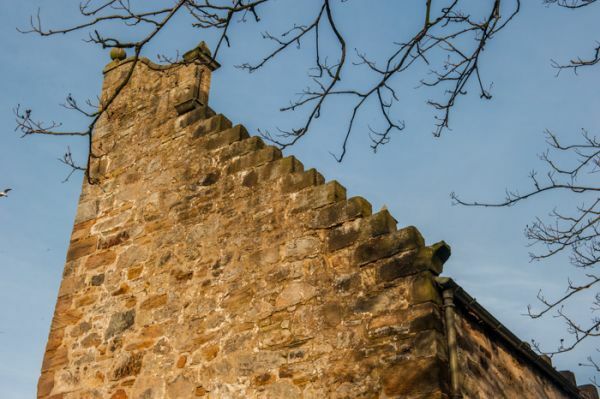 The dovecot stands within a waist-high hedge, which keeps visitors well away from the building itself, yet still close enough to make out all the building's features. There is a heavy padlock on the entrance, and on the small gate in the hedge, so its pretty clear they don't want anyone accessing the doocot directly. Location: At Westquarter, near Laurieston. Off the A803 Linlithgow to Laurieston road into Westquarter, then to the west end of Dovecot Road.